Sony's Vaio LV all-in-one PC is the direct successor to the Vaio LT desktop PC released earlier this year, but this time around, they added two crucial features — HDMI-in and an integrated ATSC tuner. This means you can watch over the air TV or connect any HD cablebox, DVR, Game Console, DVD/Blu-Ray player, etc..., without the need for special hardware. Furthermore, the 24-inch WUXGA screen works regardless of whether the computer is on or not. As far as hardware goes, the high end LV has a 3.16 Ghz Core 2 Duo Processor, 4 GB RAM, 1 TB HDD, NVIDIA GEFORCE 9300M Video Card, built-in 1.3 MP webcam and a Blu-ray burner. Connectivity options include A2DP Bluetooth 2.0 and 802.11n wireless networking. It also has tons of inputs, such as 5 USB ports, S-Video, composite video, S/PDIF, Memory Stick Pro and SDHC readers, ExpressCard/34 slot and Ethernet. Plus, the unit is VESA wall mountable, and the wireless keyboard comes with an integrated touchpad. SONY UNVEILS THREE NEW ALL-IN-ONE DESKTOP PCS WITH BLU-RAY TECHNOLOGY DENVER (CEDIA Booth #600), Sept. 3, 2008 – Merging powerful PC performance with slim stylish LCD panels, Sony today introduced three new all-in-ones- the VAIO® JS, LV and RT desktop models. Designed as space-savers, these new models are ideal for everything from everyday computing to editing high-definition video content. "These new all-in-ones address all your entertainment and computing needs- they're an HDTV, Blu-ray Disc™ player and PC in a fashion-forward, clutter-free design," said Xavier Lauwaert, product manager for VAIO product marketing at Sony Electronics. Casual Computing/ Affordably Priced The VAIO JS All-in-One desktop chassis sits directly on your desk complete with a storage space for your keyboard. Equipped with a 20.1-inch (diagonal) LCD display, the JS model features Sony's own XBRITE-ECO™ LCD technology so you will experience razor-sharp images in crisp, vivid detail. An optional Blu-ray Disc ROM optical drive is available for the JS model. Watch pristine HD content or check out exclusive movie previews and downloads utilizing BD-Live™, a Blu-ray feature that enables you to access additional content via your Internet-connected PC. The unit incorporates an integrated microphone and web cam, with face-tracking technology, so it can follow your movements while video-chatting with friends and co-workers. The JS model boasts powerful desktop computing while curbing energy consumption and noise. It comes pre-installed with Windows Vista® Home Premium operating system. 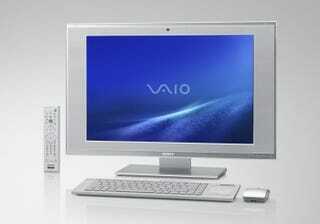 The VAIO JS All-in-One model comes in black, silver and pink and starts at around $1,000. Power-Packed HD Entertainment Featuring a floating mirror design, the VAIO LV High-Definition PC/TV serves as your entire entertainment hub. It is equipped with a 24-inch (diagonal) WUXGA (1920x1200) widescreen high-definition display, with Sony's original XBRITE-FullHD™ LCD technology, for crystal-clear images. Most LV models feature a slot-in Blu-ray Disc optical drive so you can enjoy high-definition movies. A rewritable BD drive for recording, storing and playing back personal content on high-capacity BD media is available. And with built-in DVR capabilities and an up to a terabyte of storage, you can create a personal entertainment library with up to 100 hours of HD television. An industry-unique-feature in an all-in-one PC, the LV model features a 1080p capable HDMI™ input so you can connect your compatible HD cable box, satellite receiver or PLAYSTATION®3 computer entertainment system (all sold separately) via a single cable and enjoy HD entertainment without powering on the PC. Packing powerful components, the LV model can multi-task through demanding PC applications while editing HD content. The LV model comes with your choice of Windows Vista Home Premium or Vista Ultimate operating systems. The LV model is equipped with wireless LAN and an integrated power supply allowing the unit to be cleanly mounted on a wall. A wireless keyboard with a built-in touchpad, mouse and remote control are included.